Wat Bang Phli Yai Klang is about 30 minutes away from Bangkok Suvarnabhumi Airport and is the location of the longest reclining Buddha image in Thailand at approximately 53 metres. 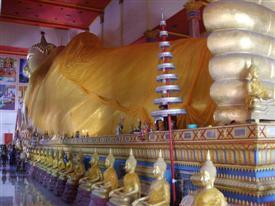 Forget about going to the more touristy Wat Pho in central Bangkok, which is also famous for its reclining Buddha image. 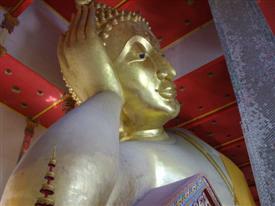 But at 46 metres the Buddha image at Wat Pho is a full 7 metres shorter than the one at this interesting temple. If you liked the 5 million Baht toilets at Wat Bang Phli Yai Nai then you will find that the toilets at this temple are at the other end of the spectrum. I probably shouldn't say any more than that. Just close by to the dilapidated toilets was a Monks timber house constructed in a tree. To be fair, there is a new temple being built out the back and it's possible that they are having some new toilets built as well, I didn't see them, but it is possible. This buddhist temple is unique in its construction because you can actually walk inside the reclining Buddha image and climb up the internal stairs up to the point where the heart would be. You certainly can't do that at Wat Pho! Inside the Buddha image you will find that the walls are painted with many scenes that are of historical significance within Thailand. One of the particuarly horrifying scenes is that depicting what happens when you enter Hell. Looks like a scarey place and not somewhere that you would want to go. Out the back of Wat Bang Phli Yai Klang there is a new temple that has just been built. It has some interesting features related the local fishing community. There is also an eco friendly Buddha with a green body and a hat to match. Out beyond the rear gates are a couple of food stalls where you can take a bite to eat and have a sit down and rest. This area of Bangkok used to be made up of rice paddies and sleepy villages. With the construction of Suvarnabhumi Airport there has been a massive influx of commercial companies coming to the area and the area that this temple sits in is now bounded by four lane highways and is in the middle of a major industrial area. Follow the instructions in the Google Map below or select Larger Map to get printable driving instructions. If you don't have your own vehicle you can take the BTS to Bearing and then take a taxi to this temple. It should be about a 20 minute drive. If you like the look of this unusual temple then you will also like Wat Bang Phli Yai Nai which is very close by and has an interesting old market attached to it.